Plastic bags are no longer allowed to be put in the Recycling dumpster. Please put your recyclables into a container or box instead of plastic bags. View or print the posters describing what can and cannot be recycled by clicking on the links above. Department of Revenue Bureau of Equalization staff appraisers will be working in the Dodge County area from February through April 2019. They will be viewing land and improvements from the road, taking pictures, and talking with buyers and sellers of selected real estate parcels that sold in 2018. Click the link above for more information about this assessment review and a list showing the names of the appraisers and the vehicles they will be driving. Snow pushed onto roads and into road right-of-ways can become a hazard for snow plows and other vehicles. Click the link above to read more . . . 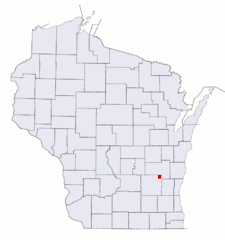 The Town of Lomira is located in the far northeast corner of Dodge County bordered on the north and east by Fond du Lac County. There are 1,156 residents that live in the township. The villages of Lomira and Brownsville are within its borders. The Town Hall/Garage is located near the unincorporated village of Knowles on County Road AY. Town board meetings are held on the second Wednesday of each month.